The feeder is suitable to feed a maximum of ten sows. The system can be used in new-build and renovation projects. Sows, but also goats, can easily access feed without spillage thanks to the round design. This prevents waste. 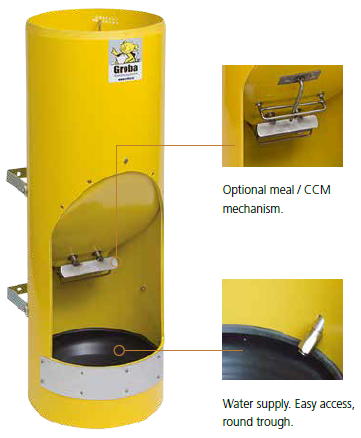 Hygienic dosing system for pellets, meal and CCM. Thanks to the simple dosing mechanism, that can be set to 15 different positions, the sows always have access to optimally fresh feed. The sow feeder is available with or without a water supply feature.